Visiting the Ir. D.F. Woudagemaal (pumping station) in The Netherlands is a true experience. And one, that you won’t forget. 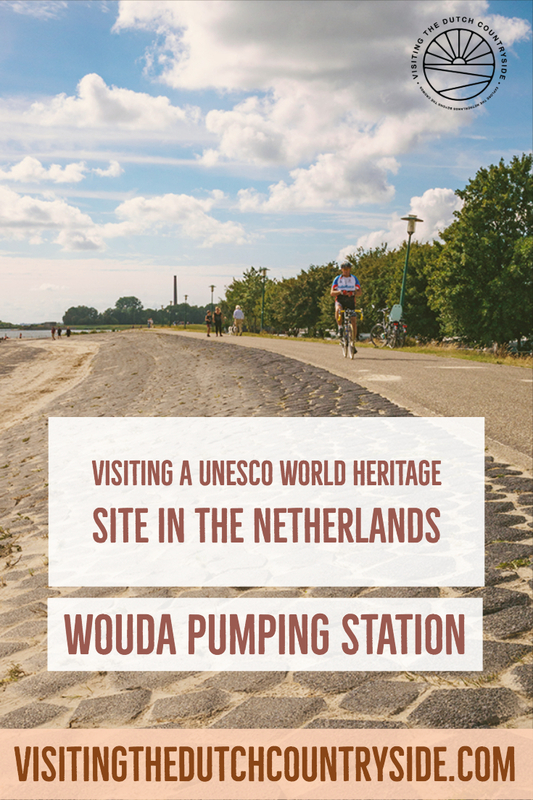 There is a reason the Woudagemaal is part of the special Unesco World Heritage Site lists. It was opened in 1920 and is the biggest and oldest pumping station that is still working. Nowadays the Woudagemaal is still used to keep Friesland dry in winter and somewhat wet during the summer. Almost half of The Netherlands is located below sea-level. Visiting the Woudagemaal is an experience that will help you understand more of our history with water and our water management. There’s a reason you are walking on dry soil in The Netherlands instead of swimming towards our local supermarket. As a Dutch person, I am used to walking, cycling, living and even swimming (yes) meters below sea-level. I know it is hard to grasp for some people, but we have been doing this for hundreds and hundreds of years. It is what I’m used to. Yet, I found visiting the Ir. D.F. Woudagemaal to be one of the highlights of my day in Lemmer. The reason for that is that the Woudagemaal reminds me to not take my dry feet for granted. We all know that our water management is very good taken care of, and so it should be, but it doesn’t happen overnight. And sometimes (most of the times) we forget that. The museum itself is wonderful, but the true reason I came there was for the guided tour. This will take you through the pumping station itself. At the museum, there is a café/restaurant that has a great view of the Ijsselmeer (a big lake that ends where the Afsluitdijk is located). I found that the guided tours were very interesting. The guides will answer all the questions you might have. They will tell you all about how the pumping station works, the history and much more. 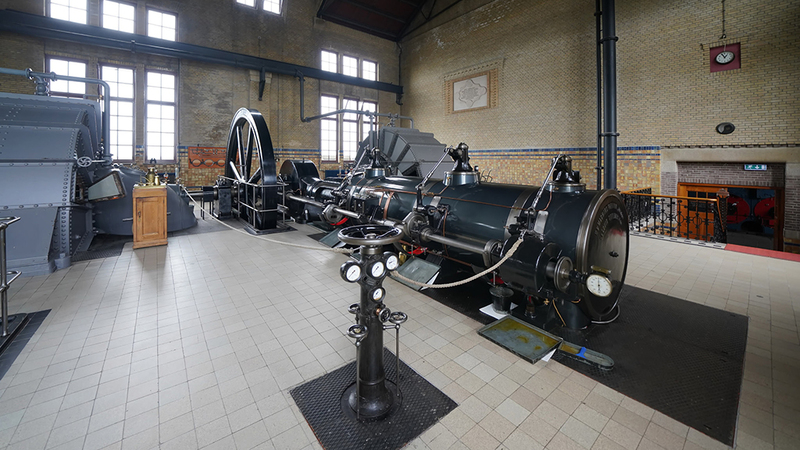 Many might have thought that a visit to the Woudagemaal pumping station is interesting for engineers and/or technicians only. I hope I somewhat changed your view on that. You will learn how The Netherlands copes with the constant threat of water and how it has developed a great system of water management. We can never beat mother nature, and we will never want to. We need to live with her and give her space. But also protect our houses at the same time, and the Ir. D. F. Woudagemaal is a big help in keeping the province of Friesland safe. During the winters of the 19th and the first half of the 20th century, a big part of Friesland was under water. Because of the floods and costs, it people decided that a steam pumping station was needed. In 1920 it was opened by, then, Queen Wilhelmina. 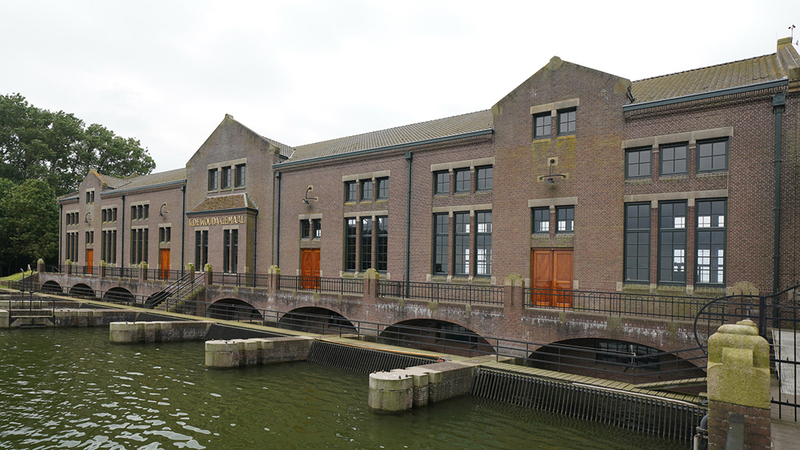 The pumping station has been built in the Amsterdam Architectural style. It is one of those styles that I enjoy looking at. It looks classy, yet old and yet, new. The building is stunning. There is a reason this pumping station is named Woudagemaal. It is named after the head engineer of Provinciale Waterstaat (provincial water management) at the time. His name was Ir. Dirk Frederik Wouda (1880-1961). 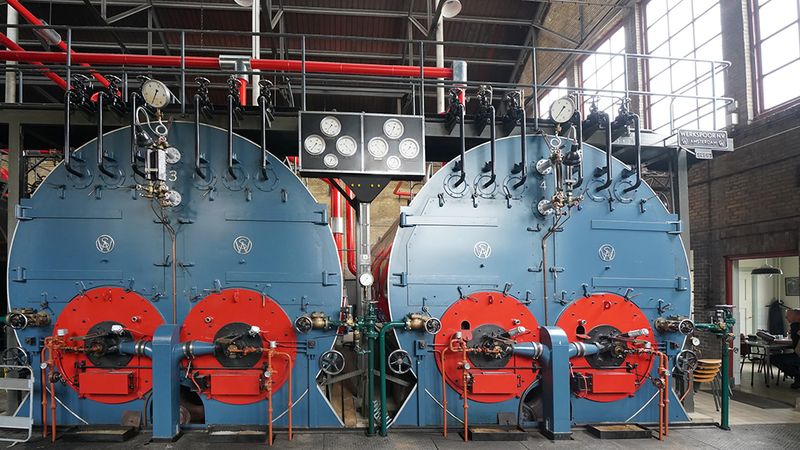 He was responsible for the design and execution of the pumping system in the Amsterdam style. The Technische Hogeschool Delft helped mister Wouda with the calculations. Up until 1966, the pumping system was used to command the surface water in Friesland. Nowadays it is working when the water levels are higher than usual. 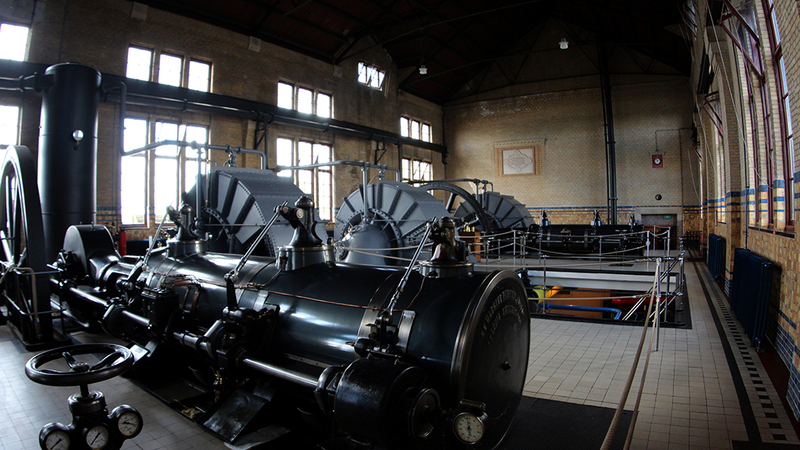 The pumping station is a special building and a Unesco World Heritage site since 1998. The 60-meter-high chimney is often used as a landmark for skippers on the Ijsselmeer. When the water is high the Woudagemaal is in use. The Woudagemaal can pump 6 million (!) cubic meters of water away, a day. Even for today’s capacities that is a lot of water. It means that in two days the Woudagemaal can dry the entire Sneekermeer (Lake in Sneek). Let’s not do that. But so you guys can understand how much it is. The museum is recently constructed. There you will find a short film about the history of the Woudagemaal. There are many panels, exhibits and interactive machines to explain the water level regulation in Friesland. After the visit to the museum/ visitors’ center, there is a guided tour of the Woudagemaal itself. If you are visiting the Woudagemaal with a group of 15 people or more, you should reserve a tour. Otherwise, you can join in with the next guided tour that is leaving. There are plenty of guided tours throughout the entire day, but, don’t expect to get in at 16:30 and still find a tour. Tours are available in Dutch, English, German and French. In the visitor’s center/museum there is a café, with a not so shabby view of the Ijsselmeer. The Woudagemaal and museum are open from February until December. In July and August, they also open up on Monday from 10:00- 17:00. You should always check in the agenda of the Woudagemaal if there are any changes in the opening times and dates. It is possible that the opening times and dates change. This is because of the fact that the Woudagemaal is still a working pumping station, and because of holidays and important dates. If you want to come with a group of more than 15 people, you need to send an email or phone the people of the Woudagemaal. The museum and the Woudagemaal itself are invalids friendly. The visitor center (museum) has a toilet for invalids. If you are planning a trip and you are invalid, please let the people at the Woudagemaal know in advance. They will take this into account and will help you wherever they can to make it into a wonderful day. Note: Most buses go once an hour. Always check the website 9292.nl or download the app for the latest details. Take the intercity (yellow train) from Amsterdam Centraal in the direction of Almere Centrum. Get out at Almere Centrum. Take the intercity from Almere Centrum to Lelystad Centrum. Transfer to bus 140 in the direction of Emmeloord from bus station Lelystad centrum to Emmeloord bus station. Get in at bus 315 in the direction of Groningen via Heerenveen and get out of bus station Lemmer. From the bus station, Lemmer take bus 47 in the direction of Sneek via Balk and get out of Ir. D.F. Woudagemaal. It will take you a little over two hours and has four transfers. Take the sprinter train (blue-white) from Amsterdam Centraal train station in the direction of Zwolle. Get out at Lelystad centrum. Take bus 140 in the direction of Emmeloord and get out at bus station Emmeloord. Take bus 315 in the direction of Groningen via Heerenveen and get out at Bus station Lemmer. Take bus 47 in the direction of Sneek via Balk and get out at Ir. D.F. Woudagemaal. It’s a 3 km walk from the center of Lemmer to the Woudagemaal. It is almost 4 km from the Lemmer bus station. So, you can take a bus or walk. From Lemmer, you can take bus 47 in the direction of Sneek via Balk from the Pampusstraat, Lemmer. In 6 minutes it will take you to the bus stop in front of the Woudagemaal. Take the intercity train in the direction of Rotterdam Centraal and get out at Heerenveen train station. From there take bus 315 to Emmeloord via Lemmer and ask the bus driver if they can ask bus 47 to wait on you or if this is not necessary. These two buses arrive and leave one minute after each other so it can get tight. Get out at bus station Lemmer. From here take bus 47 in the direction of Sneek and Balk and get out at Bushalte Ir. D.F. Woudagemaal Lemmer. This will stop you right in front of the Woudagemaal. You would still need to walk for seven minutes, but you can at least see it. It will take you 1 hour in total and has two transfers. Take the stop train in the direction of Stavoren and get out of Sneek train station. From there, take bus 47 in the direction of Sneek via Balk. And get out at Ir. D.F. Woudagemaal Lemmer. This will take you 1:30 hour and has one transfer. Take bus 315 from Hoofdstation Groningen (next to the main train station of Groningen) in the direction of Emmeloord via Heerenveen. Get out at bus station Lemmer. Take bus 47 in the direction of Sneek via Balk. Get out at Ir. D. F. Woudagemaal. This will take you about 1,5 hours and has one transfer. Take the intercity train (yellow) from Utrecht Centraal station in the direction of Leeuwarden. Get out at station Heerenveen. Take bus 315 in the direction of Emmeloord via Lemmer. Get out at bus station Lemmer. Take bus 47 in the direction of Sneek via Balk. Get out at Ir. D. F. Woudagemaal Lemmer. This will take you approximately 2,5 hours and has 2 transfers. There are two choices that you have when you are arriving from Rotterdam. Take the intercity (yellow) train from Rotterdam Centraal train station in the direction of Leeuwarden. Get off at Station Heerenveen. Transfer to bus 315 in the direction of Emmeloord via Lemmer. Get off at the bus station Lemmer. Get in at bus 47 in the direction of Sneek via Balk. Get off at Ir. D. F. Woudagemaal Lemmer. This takes you 3 hours and ten minutes, you have two transfers. Take the intercity direct (red-white trains most of the time) from Rotterdam Centraal train station to Amsterdam Schiphol. Keep in mind that you have to add a fee on your OV chip card. If you don’t have an OV, you need an extra ticket out of the machine on the train station for this special train between Rotterdam and Schiphol. You can add it to your OV chip card on the platform itself. There will be a pole, like a check-in and out ones, but with the words ‘toeslag’ on them. Do this before you get on the train. This is only with Intercity Direct trains that go between Rotterdam and Schiphol Airport. Get out at Amsterdam Schiphol. Take the intercity in the direction of Leeuwarden and get out at Lelystad centrum. After that, get in at bus 140 in the direction of Emmeloord from bus station Lelystad centrum. Get out at Bus station Emmeloord. Take bus 315 in the direction of Groningen via Heerenveen. Get out at bus station Lemmer. Transfer to bus 47 in the direction of Sneek via Balk. Get out at Ir. D. F. Woudagemaal. This will take you 2 hours and 50 minutes. You will have four transfers. Have you been to the Woudagemaal already? Or are you thinking about visiting and has this article helped you? Is there anything else you’d want to know about the Woudagemaal in Lemmer, Friesland? Have a look at other great day trips from Leeuwarden, Friesland here. Share this article!